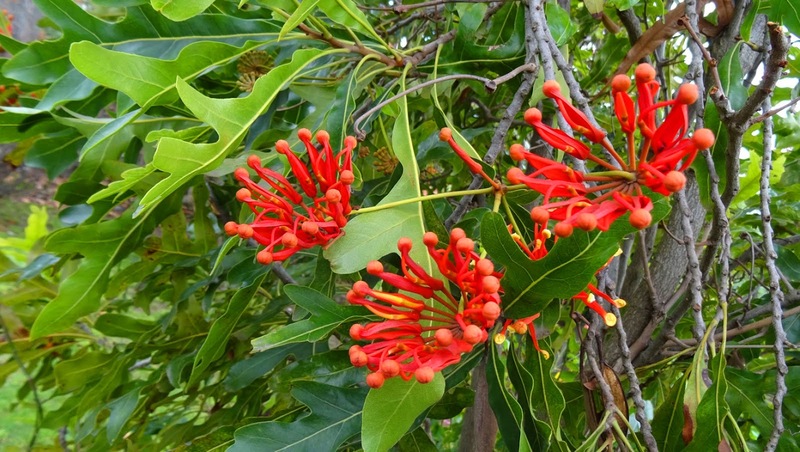 Stenocarpus sinuatus, known as the Firewheel Tree is an Australian rainforest tree in the Proteaceae family. The range of natural distribution is in various rainforest types from the Nambucca River (30° S) in New South Wales to the Atherton Tableland (17° S) in tropical Queensland. However, Stenocarpus sinuatus is widely planted as an ornamental tree in other parts of Australia and in different parts of the world. 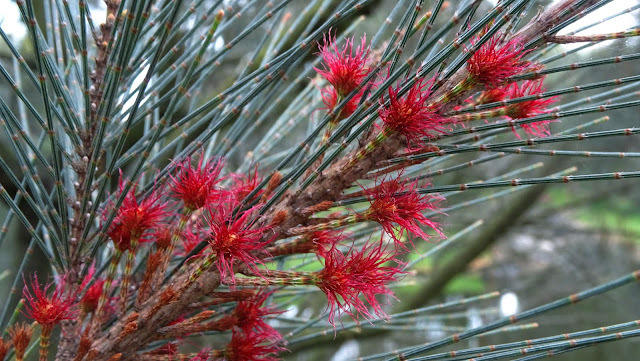 Other common names include White Beefwood, Queensland Firewheel Tree, Tulip Flower and White Silky Oak. A medium to large tree, up to 40 metres tall and 75 cm in trunk diameter. The bark is greyish brown, not smooth and irregular. The base of the cylindrical trunk is flanged. Leaves alternate and variable in shape, simple or pinnatifid, the leaf margins wavy, 12 to 20 cm long. Leaf venation is clearly seen above and below the leaf. Leaves are characteristic and easily identified as part of the Proteaceae family. The ornamental flowers are bright red in umbels, in a circular formation, hence the name Firewheel Tree. Flowers form mostly between February to March. The fruit is a follicle, in a boat shape, 5 to 10 cm long. Inside are many thin seeds 12 mm long. Fruit matures from January to July. Regeneration from fresh seed occurs speedily. Cuttings also strike well. The flower (as "Wheel Flower") is the subject of some of Australian artist, Margaret Preston's most popular flower prints (see image here, ca 1929). The thin, oval, mucronate leaves, 25–50 mm long and up to 13 mm wide, are arranged alternately and have entire margins - some forms of P. myrtifolia have thin, needle-like leaves. The attractive mauve sweetpea-like flowers, which close at night, may also be pink, magenta, crimson or white, and have a characteristic brush-like tuft protruding from the keel. For pollination an intricate piston mechanism is used. The fruit is an oval, brown, dehiscent capsule which is narrowly winged. The species is often cultivated in South African and Australasian gardens. 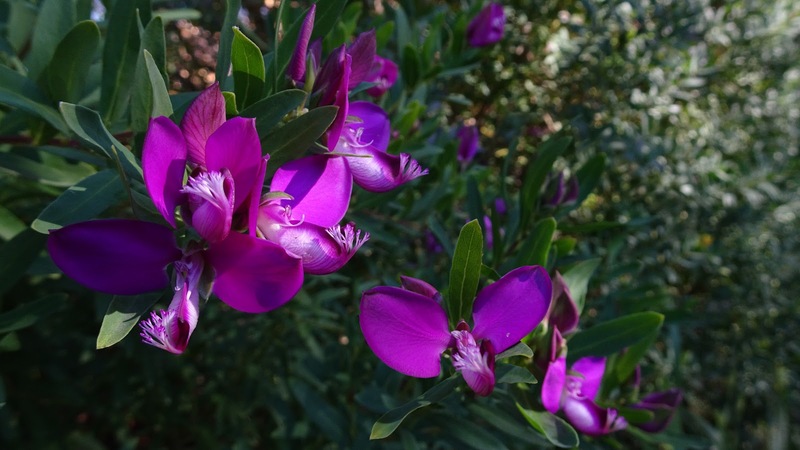 The genus of Polygala comprises some 360 species with a wide distribution in the tropics and temperate zones. 'Polygala' is interpreted as 'much milk' since the plant was thought to stimulate milk production in European cows - 'myrtifolia' translates as 'myrtle-shaped leaves'. This species has become naturalised in some of the coastal areas of Australia, Norfolk Island, New Zealand and California. This species is noted for its antibacterial and antifungal properties. Research conducted by the University of KwaZulu Natal found that aqueous extracts of P. myrtifolia proved effective against Candida albicans. 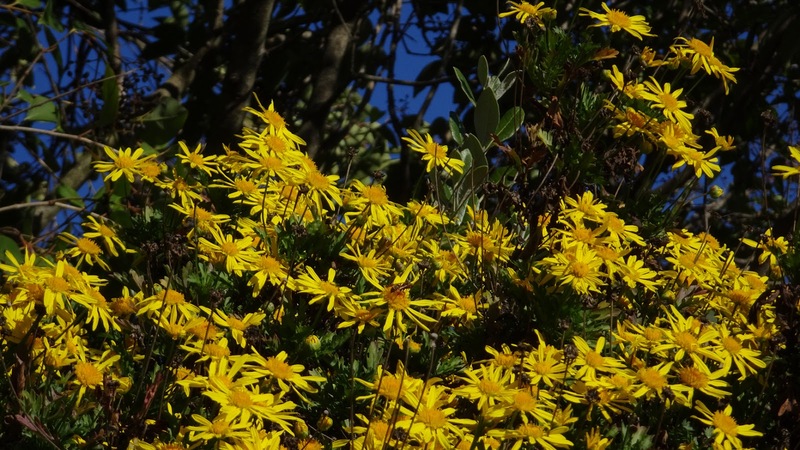 Euryops chrysanthemoides (with the common names African bush daisy or bull's-eye) is a small shrub in the Asteraceae family, native to Southern Africa that is also grown as a horticultural specimen in tropical to subtropical regions around the world. It occurs in the Eastern Cape, along the coast and inland, to KwaZulu-Natal, Mpumalanga and Swaziland. It is usually found on forest edges, in riverine bush and in ravines, as well as in coastal scrub, grassland and disturbed areas. It is a compact, densely branched, leafy, evergreen shrub, 0.5 to 2m in height. The species was moved to Euryops from the genus Gamolepis on the basis of chromosome counts. It is a ruderal weed in New South Wales, although it is not weedy in all places where it is cultivated or has naturalised. Add your own link to the Linky list below and say hello in a comment. Please visit other participants in the meme (I know I've been remiss in visiting all of your entries, however, I am currently very busy with work - I'll be back viewing all your entries as soon as I can!). Casuarina is a genus of 17 tree species in the family Casuarinaceae, native to Australia, the Indian Subcontinent, southeast Asia, and islands of the western Pacific Ocean. It was once treated as the sole genus in the family, but has been split into three genera. They are evergreen shrubs and trees growing to 35 m tall. The foliage consists of slender, much-branched green to grey-green twigs bearing minute scale-leaves in whorls of 5–20. The apetalous flowers are produced in small catkin-like inflorescences. Most species are dioecious, but a few are monoecious. The fruit is a woody, oval structure superficially resembling a conifer cone, made up of numerous carpels, each containing a single seed with a small wing. The generic name is derived from the Malay word for the cassowary, kasuari, alluding to the similarities between the bird's feathers and the plant's foliage, though the tree is called rhu in current standard Malay. Casuarina species are a food source of the larvae of hepialid moths. Casuarina obesa (shown here), commonly known as Swamp She-oak or Swamp Oak, is a species of Casuarina that is closely related to C. glauca and C. cristata. The Noongar peoples know the plant as Goolee, Kweela, Kwerl and Quilinock. It is native to a broad area of south-western Australia, with a much more restricted occurrence in New South Wales and Victoria. It is a small dioecious (male and female flowers on separate trees) tree, growing to 1.5 to 10 metres in height and capable of flowering at any time of year. It has male and female flowers on separate plants, the female plants produce woody cones in an indehiscent state, with crops from two seasons sometimes present. It is found in sand or clay soils, often in brackish or saline environments, along rivers, creeks and salt lakes. It is widely planted for agroforestry, particularly in salt-affected areas, and as a street tree.